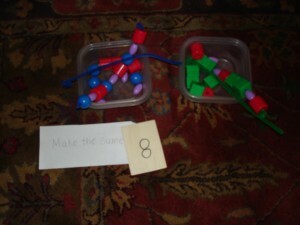 My Obstacle Course Station Activity: Lace the beads to make the same pattern. 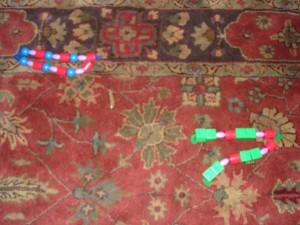 giant alphabet beads to make words! 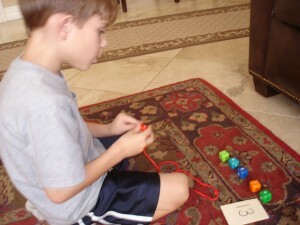 He loves making words and this was something he found purposeful and worth his time and energy. 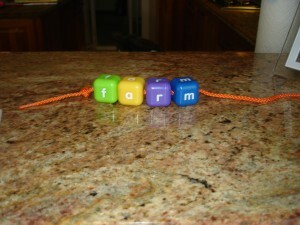 I found these letter cubes at Lakeshore learning supply store (click here for the link). He has to string the letters in the right order on the lace to form words. 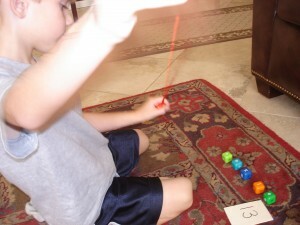 For him, this was awesome and the lacing or stringing became secondary to creating words. Working to make the word "cookie" since we had just read a Frog and Toad story about cookies. Check out the attention and focus! I chose words that went along with the theme and often mixed up the letters and gave him a written clue to make it more fun. If At First I Don’t Succeed, I Try, Try And Try Again! This was another one of those lessons that taught me to never give up! Sometimes I have to approach a certain concept or skill a number of different ways before I find something that clicks with him. There are those of you out there who may start with the letter beads and find that your child is really motivated by the lacing cards – I know I loved those as a child! The important thing I have learned is to think about what my child likes, what motivates him and then I try to find ways to engage him using that knowledge. 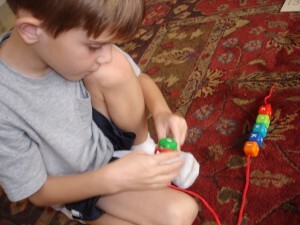 Not everything in life is going to be perfectly tailored to what he likes to do and how he likes to do it but when I am working with him at home to build the skills and concepts he is ready for, I have the benefit of providing activities for him so he understands and learns in the way that is most beneficial to him. You can do the same! !